The following tutorial shows how to install novaPDF successfully on your computer. 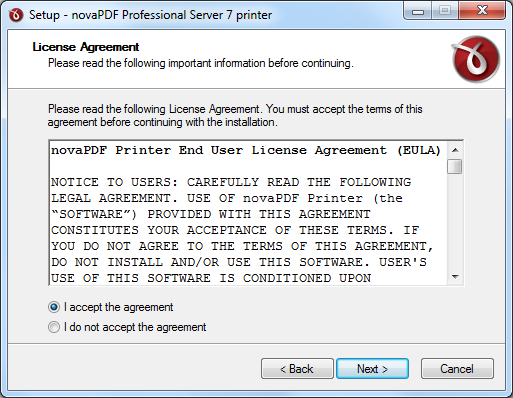 To be able to install novaPDF you need to have administrative rights. 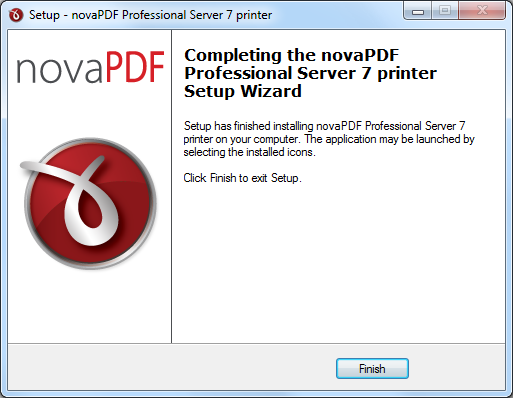 The installation process itself takes just a couple of minutes and all you need to do is follow up on the instructions for the novaPDF installation wizard. If this is a first time installation, there is no need to reboot at the end of the setup; you can print to novaPDF right after it is installed on your machine. If you have already installed an older version of novaPDF, you can install the new version on top of the older one, without uninstalling it. If it is a minor release your existing printing preferences will be preserved, there's no need to uninstall the older version. If it is a major release it will not overwrite the previous version, you will have to uninstall it yourself. After the installation process finishes, you might be asked to reboot your computer. 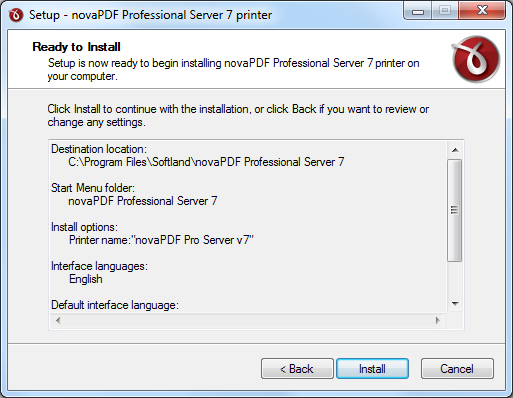 Download the novaPDF installer from our website Download page. After the download finishes, search for the downloaded setup file on your computer and double click on it to start the installation process. Once you have started the installation, the Select Setup Language window appears. Here you can select in what language you want the installation to be performed. After selecting the language for the installation, the Welcome window appears. Click the Next button in that window to proceed further in the License Agreement window, choose the "I accept the agreement" option and click the Next button to setup the installation destination. 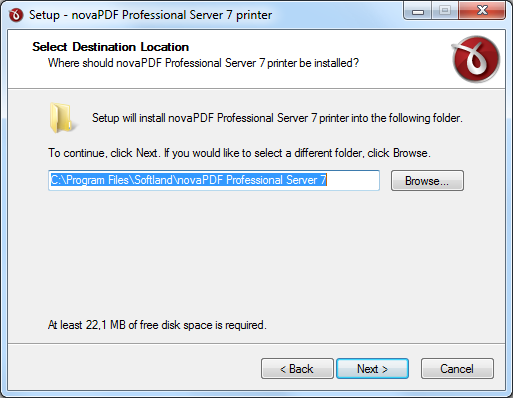 In the Select Destination Location window you can setup a custom folder where you want to install novaPDF if you do not want the default path to be selected. After this has been setup, click Next. In the Select Start Menu Folder window you have the possibility to choose a folder where you want the novaPDF program shortcuts to be placed if you do not want the default program group to be created. You can also select not to create any shortcuts folder at all for the application. 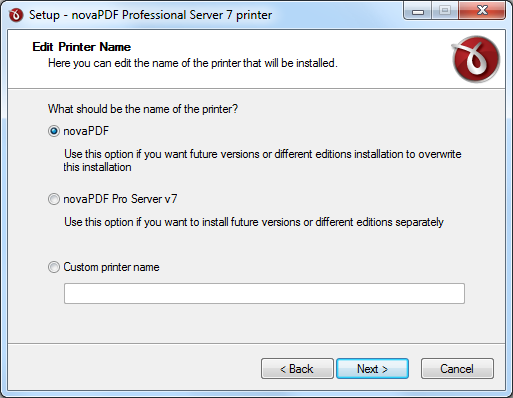 In the Edit Printer Name window you can choose the name for the novaPDF printer. This can either be just novaPDF if you want all the further installations to overwrite the original one, it can be novaPDF along with the edition and the version name if you want to install any other versions or editions separately, or it can be a custom printer name filled in by you manually in the dedicated field. 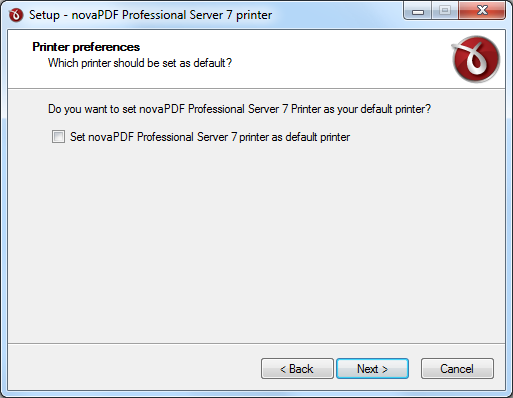 In the Printer preferences window you have the possibility to setup the novaPDF printer to be your default printer driver used for any further printing on your computer. 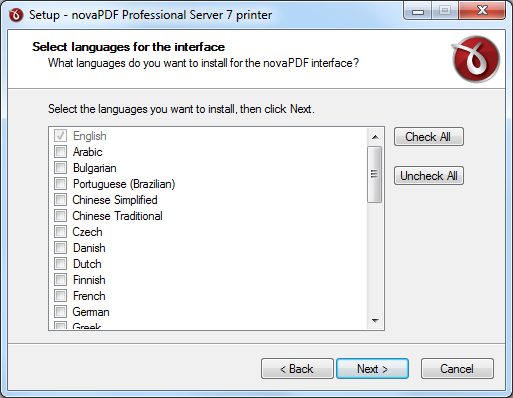 In the Select languages for the interface window you can install additional language packs for the novaPDF preferences interface along with the default English pack selected by default at the beginning. In the Add-in for Microsoft Office window you have the option to also install an add-in that will work with your Microsoft Office Word, Excel and PowerPoint applications and will allow you to create PDF's on the fly from their interfaces directly by simply clicking the Save As PDF button. Another exclusive feature for this add-in is the capability to convert hidden hyperlinks, a feature not available in the main application. The Ready to install window displays all the options that have been setup by you in all the previous steps and once you click on the install button, the installation process will start. After the installation process is completed, click on the Finish button and you can start creating PDF files from pretty much any application that supports printing on your computer. If you want to install the novaPDF application from the command line, the following article Install novaPDF from the command line explains the process in detail and also contains all the command line parameters you need to customize your installation.